DFATD manages and supports international diplomacy, trade, and humanitarian and development efforts on behalf of Canada. This large federal department, which employs more than 11,000 full-time staff, has a complex set of Information Management (IM) and Information Technology (IT) service challenges, including diverse and numerous IM/IT service requests from around the world. DFATD’s Information Management and Technology Bureau works closely with Shared Services Canada (SSC) to provide IT services to the department’s global missions. The international nature of DFATD’s mandate means that IM/IT service requests come in from numerous global locations and time zones, through multiple intake paths. With the complexity of varying degrees of urgency, connectivity, and other factors, IM/IT service requests sometimes remained outstanding for long periods of time without efficient tracking or communications with the requestor. In many cases, service deadlines would pass before SSC even received the order to perform an action. Once the project had attained executive sponsorship from DFATD’s CIO, BP&M facilitated a Lean Management Value Stream Mapping exercise that helped DFATD identify resource-wasting activities and processes. Over three days, key stakeholders reviewed the steps of the current IM/IT service request process from end-to-end. 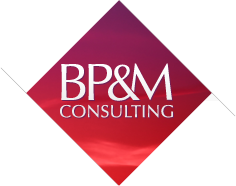 BP&M carefully guided them through the task of mapping this current state, to identify which activities added value from the (internal) client point of view—and which ones did not. What DFATD discovered was insightful. Because no standardized process existed for business intake, service requests could be directed to anyone on the team, sometimes bypassing coordinators and going directly to individual support team members. Without any tracking or coordination processes, the organization’s ability to direct the right resources to incoming requests was significantly hampered. 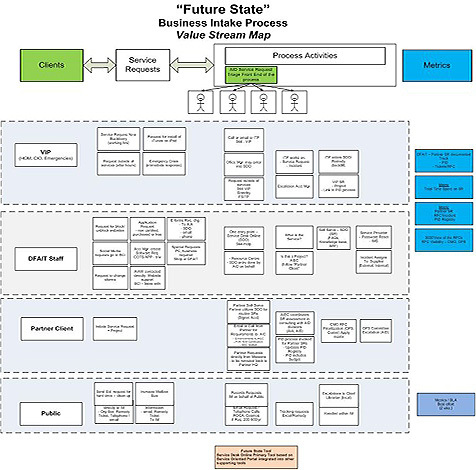 After mapping out the value stream of DFATD’s current IM/ IT business intake model and establishing a single common language with which to refer to core elements of the process, DFATD could now identify “wasteful” activities that were driving up delivery times, like numerous paths, no up-front triage, excessive processing, too many steps, and inefficient use of resources. To streamline these inefficiencies, DFATD’s Information Management and Technology Bureau leveraged its Service Desk Online Portal to create a single intake hub to address new IM/IT service requests. It also introduced a triage process to reduce inefficient activities and processing steps. This approach allowed DFATD to track requests and then define service levels so they could give clients immediate feedback on the request’s status. Once DFATD understood the waste areas in its process, streamlining reduced the number of steps in the fulfillment process by 50%. As part of its streamlining process, DFATD also established a mechanism for flagging complex projects. These are now linked into the Department’s planning and project approval processes. The Information Management and Technology Bureau, working with BP&M, also established service level standards that give management a benchmark for tracking performance and identifying further areas and processes that need improvement. Perhaps most importantly, DFATD IM/IT employees were part of the improvement effort and now feel engaged and empowered. DFATD now has a streamlined IM/IT process and the team has successfully completed all of the 30/60/90-day action items from its Lean Action-Out Report.